After installing the Ford Racing 24lb/hr injectors, performance improved but the engine ran too rich and gas mileage took a dive. To remedy that problem, I had to get more air in. 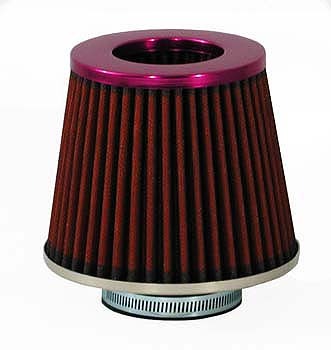 This meant replacing my ram airbox and K&N panel filter with a higher-flowing cone filter. I didn't want to spend a lot of money to buy the K&N FIPK (fuel injection performance kit) so I decided to make my own. 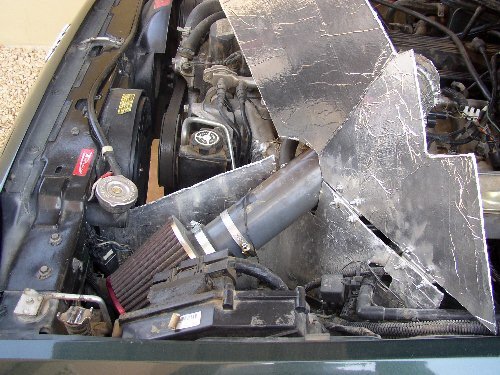 It cost mere peanuts by comparison and my heatshield does a better job at keeping out hot underhood air than K&N's. I used a Simota Powerstack cone filter (WS002 160mm wide X 130mm high X 77mm neck) that flows ~810cfm @ 1.5inHg. That's much more air than the K&N panel filter can flow (455cfm @ 1.5inHg), and more than the cone filter that K&N uses in its FIPK (652cfm @ 1.5inHg) application for the Jeep Cherokee 4.0. The S&B High flow Powerstack Cone Filter from Intense Performance is an excellent alternative and comes in a range of sizes. I constructed my own airtube from a 13" length of 3" diameter plastic pipe. The Powerstack has a 3" opening and bolts straight on. The pipe is joined to the bored throttle body (TB) by a larger diameter than stock corrugated rubber tube that's insulated from the heat. This tube curves more gently onto the TB and doesn't have that nasty 90+ degree bend that the stock tube has. 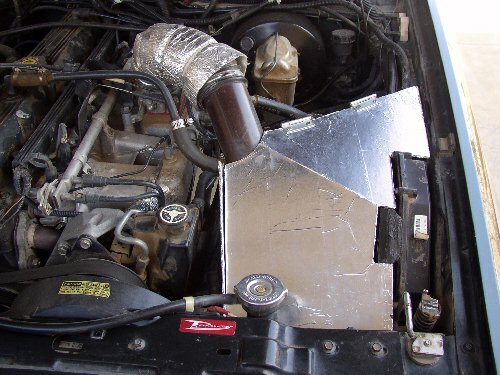 Since I also wanted the engine to inhale cool air from outside instead of hot air from under the hood, I constructed a heatshield that completely encloses the filter from the back, sides and the top, thus isolating it from the engine compartment altogether. The heatshield is made from double-ply cardboard and covered with self-adhesive foil tape to make it waterproof. The top part is a separate piece that forms the "lid", and is hinged to the wall of the heatshield. It can be opened and closed to allow inspection of the filter. Cool air enters the space around the filter from where the old airbox inlet tube used to be. I now have the temperature probe mounted in that space. At any speed over 25mph the intake air temperature is the same as the ambient temperature, so the heatshield definitely works. 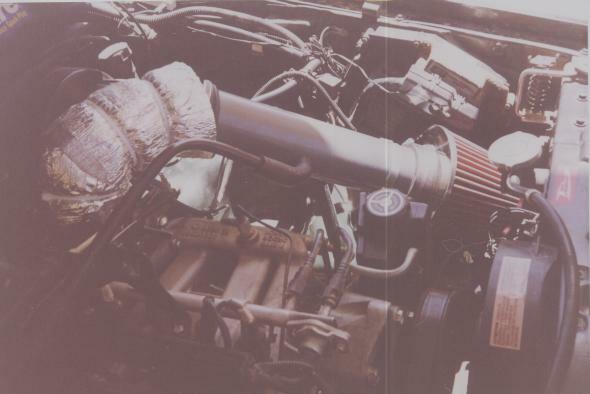 The increased airflow partially corrected the rich condition that was caused by the larger injectors and produced a small increase in horsepower and torque. Gas mileage improved by 1.1mpg so I was very happy with the result. Another bonus was that the FIPK occupies less space under the hood than the factory airbox. The only downside was a slight whistle at light throttle but this wasn't intrusive.